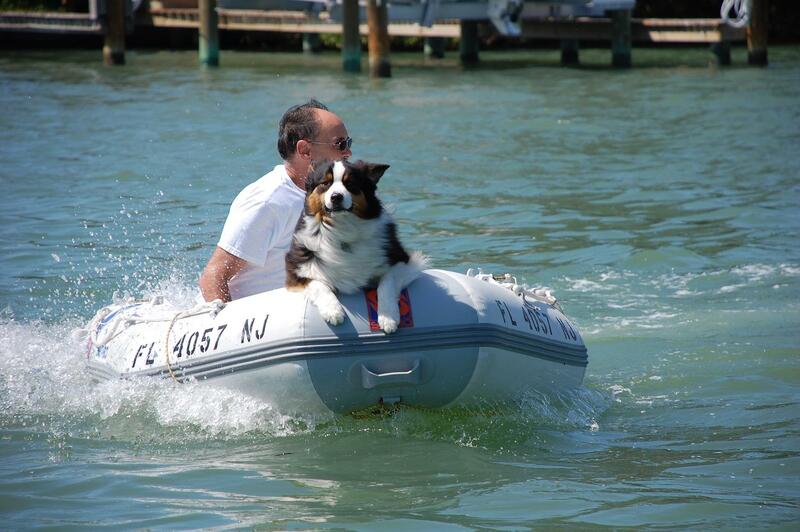 What Breed Is Your Sailing Dog? Jack Rascal Terror...Buster the Bad! 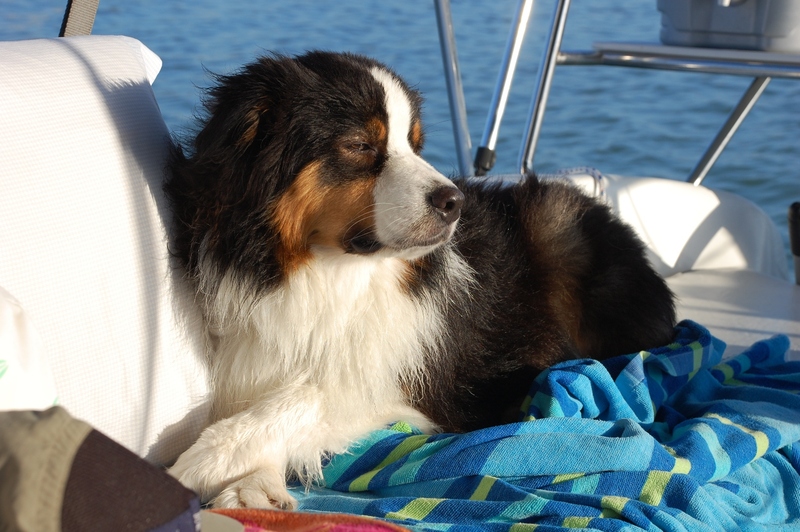 Nessie, our Australian Shepherd, loves cruising on board Bochinche, a Catalina 250. We used to have a pitbull sailing with us sadly she died at the age of 11 years and we decided to wait a while before adopting another dog!! This strong stance only lasted 8 weeks upon our arrival in Sines Portugal we met Daisy the dog outside the marina bar we were told she would latch on to any new boat that pulled in in the hope that someone would adopt her but in the meantime she would catch fish from the sea herself or cadge sardines from the fishermen or scraps from restraunts After a few days Daisy decided we she quite fancied our boat and jumped aboard, as we still had food left from our last dog it seemed a shame for it to go to waste!! That was nearly 2 years ago now and Daisy our little mongrel (black and tan) is still with us we think she was either dumped or lost from a boat as she has taken to sailing like a duck to water the only time she gets upset is when we start the engine and are getting ready to leave a marina we think she is still worried she could be turfed off again despite our reassurances that that aint never gonna happen!!! I am still very curious as to where she came from in the first place though!! !I would say if you want to get a dog go to one of the many rescue homes around there are always many dogs there just looking for a chance! Great photos, beautiful dog! And he looks right at home on the water. And Joanne Turner, your story of giving your new companion a second chance at the life aquatic touched my heart. I know you miss your previous dog terribly, but there is always room in a compassionate heart for another opportunity to experience the blessings of the human/dog bond. My Welsh corgi, Lil, just passed in December. She wanted to be where I was and sailed with me for two summers. Lil was a great trooper, however she was not built for agility and struggled with mobility on the boat. So when choosing a new dog I picked one that will be more lithe and capable of jumping in and out of the dinghy, climbing the companionway stairs etc. Here is Lil, bless her little soul. There will be another litter next year. My Vet friend is urging me to find a Schiperke, or adopt one from the rescue net. I have shared living quarters with a miniature schnauzer (long gone and still mourned) so I would really like to hear about any Schiperkes you guys might have met. I have a catamaran, sail the Chesapeake Bay, and have a small backyard. I sail with a constant and varied stream of people, so I would love a social butterfly! Layla's crew includes two adopted female Schipperkes; Cassie and Flash. Wonderful, quite protective , easily excitable, full of energy and very much in need of exercise kind of dogs.... The older one (almost 11) has slowed down a tad bit but still stands her ground. Not sure about others but mine definitely shed(!) They need to be regularly brushed. All in all, I have never regretted adopting the two ladies, I think you'd be very pleased If you get a Schipperke. Thanks for the compliments. Nessie is a 5 year old tri color Australian Shepperd. Her color patterns make her look like a Bermese Mountain Dog. She is 50 lbs, loves the boat, dinghy, swiming and taking naps on deck. Nessie is very obedient and like the shepperd dog she is, Nessie is always watching us, making sure that we are OK. For us, she is the perfect boat dog. We have two Rotties. Sugar Bear and Oaklee. They love the boat, water, Docks and marinas. In fact they have become the official mascot of our marina where we are moored. Could not ask for a more stable breed and temperament.